2124, Used Rims, 16x8, 8 LUG, 6-1/2, 00-02, Dodge, 2500, Pickup, 5 OVAL HOLES, ALLOY. 3196b, Used Rims,17x7-1/2, 5 LUG, 135MM, 97-99, FORD, F150, PAINTED GOLD IN WHEEL POCKETS, 5 OVALS. 50 ANNV. COMES IN 12MM OR 14MM. 3207, Used Rims, 17X7-1/2, 5 LUG, 135mm, 97-00, FORD, LINCOLN, EXPEDITION, F150 NAVIGATOR, CONVENTIONAL SPARE WITH BOLT HOLE FOR MOUNTING, 12mm WHEEL BOLTS WITH 14mm BOLT HOLE, 5 OVAL HOLES, STEEL. 3338f/3408f, CENTER CAP, USED FRONT, OPEN. 16", 8 LUG, 00-05, FORD, F 250, 350, EXCURSION. CHROME 8-1/4" DIA. ALUM 5 OVAL OPENINGS. 3421F, CENTER CAP USED, 01-05, FORD, F250, SUPER DUTY, CHROME PLASTIC CAP, 8 LUG NUT CAPS, OPEN CENTER, 8 PLASTIC CLIPS, 8-1/4" DIA. 3756, USED RIM, 16X7, 8 LUG, 6-1/2", 07-11, FORD, VAN, E150, E250, E350, ALUM, 5 OVAL GRAY POCKETS. 7019, Hubcap used, 15", 99-02, MERCURY, VILLAGER, SPARKLE SILVER, 5 OVALS, FAKE LUGS, RAISED LOGO, 5 SETS OF PLASTIC CLIPS & WIRE RING. 7019, Hubcap used, 15", 99-02, MERC, Villager, SPARKLE SILVER, 5 OVALS WITH FAKE LUGS, RAISED LOGO IN CENTER, 5 SETS OF PLASTIC CLIPS & WIRE RING. 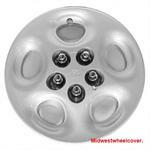 7039b, HUBCAP USED, 16", 04-07, FORD, FREESTAR, 5 SPOKES, 5 OVALS, SILVER FORD OVAL, HELD ON BY LUG NUTS. A=BLUE FORD OVAL. B=SILVER FORD OVAL. 931, HUBCAP USED, 15", 97-98, FORD, MUSTANG, 5 OVAL HOLE, WITH EXPOSED LUG NUTS. 946, HUBCAP USED, 15", 96-98, MERCURY, Villager, 5 OVAL HOLES, PAINTED LIGHT ARGENT.